Our Impress series architectural controls are state-of-the-art using capacitive touch technology. These new stations provide full touch capability including the zone level control sliders. In addition we offer color touch LCD with a projected capacitive touch interface, several optional control interfaces, and 0-10V analog. 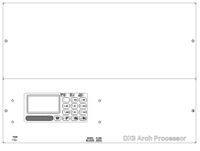 Lehigh’s DX3 Arch Processor provides an integrated architectural controls processor compatible with Lehigh’s Collage Impress architectural controls. It supports 128 control channels, 16 rooms, 24 presets, room combine, astronomical timeclock, and scripts. It has a DMX512 input, DMX512 output, Ethernet, USB ports, built-in ride-thru circuit, and a capacitive touch user interface for system configuration. The unit provides the sophistication to function as a dedicated architectural control or to provide a seamless interface between a theater’s stage and house light controls including system wide presets for capture and recall of both stage and house lighting. A versatile yet easy to use controller with 800 X 600 color LCD and projected capacitive touch interface. The touch screen's menu displays provide a control interface that anyone can use. The CT600 can serve as a master controller in a single room or, when used with DX2 dimming systems can also serve as a mutli-room master controlling up to 16 rooms or partitioned rooms such as a ballroom. The Collage Impress CTM612 and CTM606 offer a state-of-the-art capacitive touch interface for architectural lighting control. These sophisticated, yet easy to use controls are the first in the industry to provide mulitple touch slider control. Collage Impress remotes offer a state-of-the-art capacitive touch interface for architectural lighting control. Elegant stations with custom backlit button legends. This series also offers the first LCD remote station in a single gang size. impress DMX offers the same sophistication and elegance of our Collage impress architectural controls using DMX512 communication for simple integration into any DMX-based lighting system including support for controlling RGB color LEDs. Lehigh Single Set control is a low-voltage 0-10V analog control system providing affordable dimming control for new as well as legacy analog control systems. Collage architectural control systems offer several interface options including RS232, Collage to DMX, 0-10V fluorescent option, and analog I/O devices for 0-10V or dry contact I/O.